The musician who was a defining figure of Asian Underground is back after a hiatus of three years - and he wants to break 'free from the traps of the past'. Karsh Kale is back in 2019, and how. After a hiatus of three years without a release, Kale came out with the EP Little Whale with friends Gaurav Raina of Midival Punditz and Ankur Tewari in January. This was followed in February by the eclectic background score for Zoya Akhtar's Gully Boy, for which Kale collaborated with Savage Audio Collective. And later this year is slated an original release, which could be an album or an EP. This flurry of activity is welcome news for the fans of the 44-year-old musician, who has been one of the most prominent faces of South Asian electronica and fusion music over the last two decades. "Since 2001, I had been releasing [albums, EPs] regularly and I stopped, realising that I didn't need to create that much output all the time," said Kale. "I also wanted to do something new [and] fresh, and that needs time to build up from within. Music anyway has such a short shelf life now, and many artists don't realise that doing the same thing over and over is not the answer." Kale began his career by performing on the tabla and drums as a session musician for the likes of DJ Spooky, Chaka Khan and American bassist Bill Laswell in the late 1990s. He dropped a self-produced EP in 2000 called Classical Science Fiction From India, and followed it up with his debut solo album Realise the following year. That same year, Kale joined the musical group Tabla Beat Science, whose members included Laswell, tabla player Zakir Hussain, percussionist Trilok Gurtu, sarangi maestro Ustad Sultan Khan and electronica artist Talvin Singh, among others. This rapid success got Kale associated early on with the Asian Underground scene, which was booming then. Over the years, Kale collaborated with Indian and international musicians of various genres - Indian classical, jazz, rock, hip-hop and electronica. In addition to touring and making music for films, Kale kept releasing albums and EPs through the 2000s. But now, he says, he wants to become "free from the traps of the past". "I am rethinking the approach that I take in using Indian sounds," he explained. "I had done a lot of electronica in the past, but this will be more organic. There will be more songwriting elements [in the new release]. I am sure there will be some hip-hop influence in whatever I do next. But music cannot be preconceived. It's only when you work for four-five years, and look back at what you did, you realise that you have something worthwhile, like [it happened] with Little Whale." The Little Whale EP, running a little over 17 minutes, was released on January 18. It includes four songs that blend ambient music, sparse beats, minimal acoustic music and ethereal vocals, which are primarily in Tewari's falsetto, with Kale in the background. "I have always sung a couple of songs in my albums, but there's going to be more of me singing in whatever I release next," he said. Kale recently sang a blues-y bit for the track The Train Song from Gully Boy. The bilingual song, which also features Raghu Dixit's vocals in Hindi, is used in an end-credits sequence. It sweeps over the breezy visuals of the hero, Murad (Ranveer Singh), running across a railway station over-bridge to see off his girlfriend Safeena (Alia Bhatt) before she boards a train. "We have opened the door for a bunch of hip-hop artists and that's great," said Kale on the success of Gully Boy. "The movie will cause a boom in hip-hop, a cultural revolution in music, many of which I have seen in my career." The film's background score, said Kale, "is not about creating one sound but addressing many concerns, many facets, many eras.... Someone from Dharavi listening to hip-hop is already giving [background score composers like us] an opportunity to explore so much of musical history." In an earlier interview with Scroll.in, Kale mentioned how growing up in New York in the late 1970s, during a time hip-hop was taking off thanks to the likes of Whodini, Slick Rick and Afrika Bambaataa, helped him contextualise the Mumbai hip-hop scene. Pointing out the similarities between the two, he said, "This was music coming from oppression, which is why hip-hop gets respect. But these guys were poor and famous, not rich and famous, [which is] exactly how the Mumbai scene is." While Indian hip-hop looks full of possibilities now, Kale warns that the inflow of money could affect it adversely. "What keeps things legitimate is not the mass consumer but people holding the original scene up," he said. "...when money gets thrown at the wrong person doing the wrong thing, who's not representing the scene itself but cashing in on something trendy, the people who brought the scene to where it is today will decide its future." While money will "come in and out of the industry", he believes it shouldn't be a cause for worry as "Mumbai hip-hop is a legitimate scene and not an artificial trend. The thing people need to understand is that even if Bollywood lets go of this thing, it is still going to fly." 'We All Fall', Karsh Kale (2014). Kale has always stayed on the fringes of commercial film music. As he puts it, one can "either be an artist or a craftsman". "A craftsman is someone who will deliver whatever's asked for. If you work in film exclusively, then you will have to bite the bullet and accept a lot of things you aren't necessarily connecting with. I need to be able to do that and respect the story and vision." Kale has contributed to films like Karthik Calling Karthik (2010) and Soundtrack (2011). He even sang playback for the 2009 film Kambakkht Ishq ("I hoped you wouldn't remember that...I did it for my friends [composers Salim-Sulaiman]"). But now he's keen on working for films that he respects, which was what drew him to Gully Boy. "All over the world - not just India - the most ridiculous entities are asking us to make the most boring commercial work," Kale said. "They say, 'I am a huge fan but I will pay you to make what I like, not what you like'. Bollywood is the tallest peak of that mountain range. But since I do so many other things, I have the luxury to pick and choose work, and not give up my creativity for sustenance." Another grouse of Kale's is with what often gets passed off as independent music in India. "One misnomer is the idea of independent artists," Kale said. "In the United States, where the term emerged, indie meant not taking money from corporations to change your artistry. You don't take artistic direction from people who don't know more than you. Like, Radiohead refuses to take money from corporations for their music and tours. Punk in the 1980s and hip-hop did not compromise with artistic integrity for money. That's indie." Karsh Kale and Midival Punditz live at Paleo Fest, Geneva (2009). 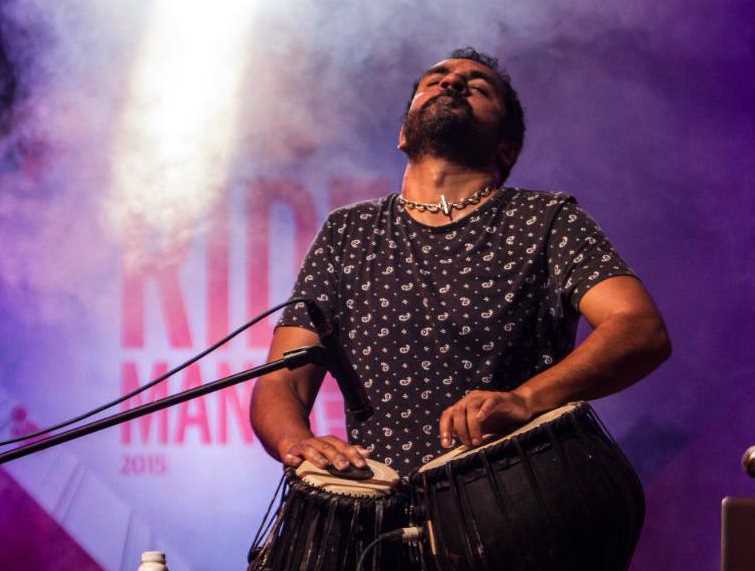 Kale's decades-long musical output has been built on fusing various genres with his percussion work, which is closely associated with the electronic tabla - an instrument, whose inbuilt mics result in a louder, groovy output that can hold its own alongside louder live instruments like the drums or electric guitar. Kale's solo work can be largely categorised as electronic music, a genre that he feels is constantly in a transitional phase. While rapidly evolving music production technologies have sped up the pace of experimentation in electronica, he says it doesn't necessarily mean that all the output is praiseworthy. "It's like when the electric guitar was invented, boys would buy one, learn three chords and join a band, but maybe five per cent of them actually created something worthwhile," Kale said. "I would say electronic music has suffered a bit this way, but every once in a while, a new artist comes and changes things." How did it suffer? "A lot of electronic music, after emerging from the underground, gets amalgamated into pop, and anything new there is milked to the last drop," Kale said. "The experimentation goes on while it stays underground because artists dare to think differently." Indeed, the electronic sounds of the 1990s like drum and bass, acid techno and jungle music, which formed the bedrock of artists like Kale and his peers from the Asian Underground, have vanished from the mainstream. Karsh Kale and band perform Radiohead's 'Paranoid Android' and Pink Floyd's 'Us and Them' in Kolkata (2013). The conversation shifted to how hip-hop has replaced rock as the dominant form of pop music internationally over the last few years. The success of Gully Boy in India could possibly trigger a similar explosion of rap in the country over the next couple of years, signs of which are already showing. Could we be looking at an over-saturation of hip-hop in the next 10 years, just as guitar-based rock-and-roll got slowly dethroned after dominating mainstream pop for five decades? Kale says it's important to not look at hip-hop and rock as different genres. "Hip-hop is a continuation of the anti-establishment attitude that is at the core of rock-and-roll," he said. "It's all the same, so is electronica. Tomorrow, if some band shows up making great music with Led Zeppelin-esque riffs, that sound will re-enter pop music. It's all cyclical." Is there then any space left in contemporary pop music for the kind of Indian classical music Kale has dabbled in so far? "Probably as sound bites," he said. "Just an alaap anyway is three times the size of a pop song. The only way that can be fit into pop music, as a riff or in the form of line, is a sound bite, which is what I have done for a long time. I mean, it's like wondering if you can use ballet in hip-hop? Yes, of course. Pop music is ultimately sound collage."